By now you must have heard that Guy Kawasaki, the master of Mac marketing has just released a new book. Enchantment covers every tool marketers, sales and even customer services people have available to them to individually and collectively enchant customers. I've written my impressions of the book, and even have a Q&A direct from the mouth (well really keyboard) of the master himself, so read on! The big question the book addresses is "why enchant customers?". The answer, obvious to the social media generation maybe is because they advocate your products and your brand, buy more and persuade others to buy more. 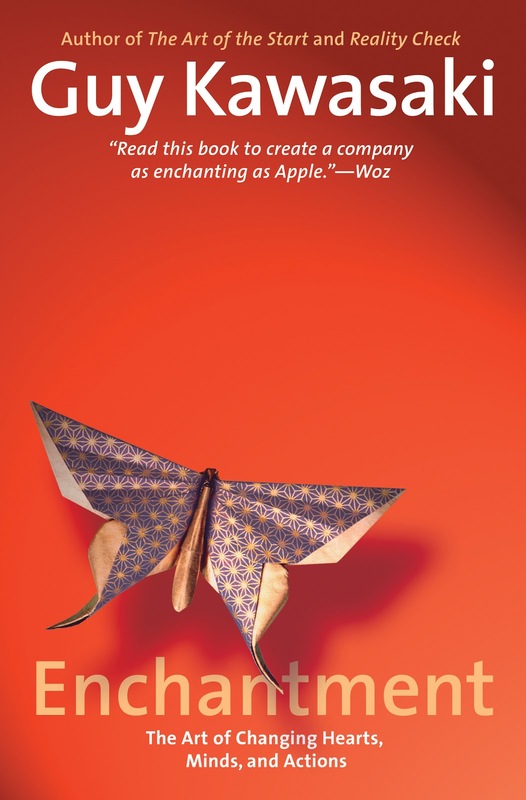 Enchanted customers, as Kawasaki explains with multiple examples, are a powerful force, and are way more valuable to a brand's success than the "rich, famous, and traditional influential people", the media superpowers such as himself. After all, if I can be a blogger, anybody can be a blogger, and many (most) of you are going to be a hell of a lot more influential than me. When you add all those voices together, if you can get them to talk about you, many more people are going to hear, believe what they are hearing, and will subsequently buy what they are hearing about. In Kawasaki's words "Nobodies are the new somebodies in a world of wide-open communications". The book has been described by several reviewers as the "How to Win Friends and Influence People" for the 21st century, and even before I read the other reviews (or even the back of the beautiful book cover) I was coming to the same conclusion. There is a lot written about how you, as an individual can affect people's perceptions of you personally, and therefore the brand you represent. I wasn't reading this as enchantment (initially), just how to be a better salesman and not piss people off. As I read on though, it starts to fall into place. If you are an insincere or bad person, you are going to struggle with enchanting customers and might as well stick with conning them into buying your junk using your current devious tactics. Kawasaki reinforces the importance of being good and not confusing successfully 'selling' with 'enchanting' several times as the chapters progress. He even has a fun online test to see how enchanting you are. An interesting theme that I found challenging in the book was around building an ecosystem around your product. I understand this is hard, and a great point that Kawasaki makes is that for an ecosystem to work, you have to create something that is worthy of that ecosystem. You need a great cause, and if you have it the ecosystem will probably grow itself. The challenge for me out of this, and many small and mid-sized businesses is providing one thing that can be identified as good enough to warrant and ecosystem, and identifying enough like minded people who can seed it. The ecosystem starts to be a realistic concept when you already have some success. I was going slow when I read this, as I kept trying to understand how a startup with five paying customers can develop and ecosystem. The book is targeted at all phases of a lifecycle of a company, and this part just happens to be down the path from where many of us are now. So, the really good bit of this post is the stuff that you won't read in the book. A really quick Q&A. Questions are from yours truly. Answers are from the master of enchantment, Guy Kawasaki. PA. Enchantment sounds like a wonderful goal for big brands (and there are many big names [in the book] to back it up). But what about the small businesses growing from the ground up? What is the most important thing a small business owner can learn from the book? GK. Enchantment isn't a big, expensive, "hire a consultant to get it done" activity. Not at all. In fact, those qualities are the enemy of enchantment. The bottom line is that a small business should employ people who are likable and trustworthy, and it should sell a great product or service. Money isn't the gating item. The hard part is realizing that there is a better way to do business, and the flexibility to give it a try. PA. The enchanting experiences require us to think differently and interact with customers differently. Is this just a change in the way we educate employees, or do we need to fundamentally change the nuts and bolts processes that businesses run to allow this to happen? GK. There is a causative relationship: if you educate employees and empower them to enchant customers then, quite naturally, they will change the nuts and bolts processes of the business. Management, however, has to believe in enchanting customers. My recommendation is that instead of announcing a great enchantment campaign ("Oh God, the boss read another book..."), management should start with small things. Stuff like answering email faster or returning all customer phone calls. Take it a step at a time and build upon success. PA. Working with customers in an enchanting way sounds like it is extremely time consuming and probably quite costly. Are there any short cuts a small business can take? GK. Quite the contrary, enchantment is not time consuming and costly. How much more does it cost to smile, dress appropriately, and give a good handshake? And to act in honest and trustworthy ways. "Shortcuts" is a loaded word. I don't recommend shortcuts that amount to putting lipstick on a pig. But the foundation of enchantment is not hard or costly. It's just different. As you can see from just the answers here, there is a lot for small and mid-sized businesses in Enchantment. And it comes down to personal commitment and presentation, as much as complex organizational changes and expensive marketing campaigns. We think the same it seems: simple changes to the way a business works can have profound effects. Gary has another rule of thumb that I remember as "10-20-30". 10 slides or less, 20 minutes or less, and all text on slides need to be at least 30 points! Totally off the topic of Enchantment, but Gary's quite the educator. I am a sucker for self-improvement/basic human psychology books, especially ones with interesting graphics as well. I'll have to seek this out. It's gracefull to see what i was searching for. That's the material which I was searching about. The matter you've highlighted above is surely valueable for anyone to workout. the concept of your article is very true and It will result in a positive way. Thanks you very much for sharing this with us. Very nice blog. The concept which you discussed above is really informative for anyone. Glad to read your post. The topic that you discussed above is truely very useful. It is really help for anyone to workout. I like it and i will recommend it to others. Thanks for sharing this type of information. Good luck for the future posts. Who says you can't have custom apps in the cloud? My website wants to be the "belle of the ball"
Strategic thinking in the "Browser Wars"? Do mid-sized businesses have money to burn?